I have some fun projects I would like to Share with you. The purple clematis has taken off very nicely too this year. The only thing I do to this is trim it down in the winter, I can’t believe how fast it grows. This Jasmine we planted four years ago when we first moved in….again I do very little to it, but trim it. It smells really pretty when you are walking up to the entrance. Now on to some projects. As you can see a little paint transformation. My friend gave me this cross as she had no where to put it after she purchased it….well after she saw how I displayed it, she wanted it back…NOTTA happening….. I also painted the watering can, it was a copper color and I forgot to take the before. Then I decided I would add some numbers to it. I may have to distress this cross…the more I look at it..I need to rough it up a bit. Next project in order now….. I used house numbers that you buy in a package at Walmart for I believe $6.00, however you receive 30 of them…so that is pretty good…..I ran out of black spray paint and have to pick up another can so I can finish the bottom of the planters…..that will drive me nuts! Not a far drive if I may add…..
My $3.00 find at Goodwill today….thought surely there is something I can do with it! This post is extremely old and many things have changed since. I am glad you stumbled upon it though. I have to say, there has been an evolution on my part since. I love those yellow pots Debbie.I would never think of such a bright color but it works! Wow, you sure are creative. Cute, I love your yellow pots! You're so brave with color. You better nail that cross down, your friend might come and take it one night. I have a chair that I found in the dumpster last week so I'll link up to your party on Sat. although it's not complete yet I need some idea's for it. I'm so thrilled about winning your giveaway!!!!!!!!!! Your front entry is beautiful!! Oh my! Charming, Debbie! So charming! LOVE the magazine rack and the cross and the plants! AND the planters! I do NOT want to sit on that porch. I really like the cross too. Isn't it amazing what a little paint can do? Debbie, everything is so pretty. I love all the stuff you painted. Love the numbered pots. I was thinking about doing some, but haven't gotten to it. Your yard looks great! Everything looks so great Debbie! I love the pots! Your yard is beautiful! Love the yellow pots!! Love the chairs on your porch. Love the yellow pots, numbers on the watering can and all the clever ideas and colors! Glad to see there is still hope for my Japanese Maple. This was a tough winter up here in Chicago. Love the yellow pots with the numbers. Too fun and cute. I'm going to have to give something like that a try. Great entrance, but I would just pull up a rocker, grab a glass and sit for a spell. Everything looks lovely, funky and unique! You did a great job as always and, boy, would I have grabbed up that wooden handled stand/rack, too?! Glad you enjoyed your visit to Riverbanks Zoo in Columbia, it is an awesome place! TFS! You have a superb, welcoming front yard, the Japenese Maple is fantastic. I'm shopping for one this year. The Clematics is beautiful. Everything looks great, the jasmine really caught my eye-love it! Beautiful! It makes me want to come hang out on your porch! Your yard is so colorful. I love it all! Once again, you leave me impressed with your creativity. You know how to spice things up and it looks great. Lovely landscaping, by the way. Beautiful bright colors! Love the pots with the numbers, very cute! I like your ideas for the yellow pots and numbers. Great job. You have a super creative mind and have done so many neat things. I really love all the pretty flowers. Your Jasmine reminds of a turkey. First off…I love your photography! Especially the close-up photo of the two #1 pots and the petunias. Then there's the watering can with the address on it…you've given me inspiration to dust off my old watering can and turning it into something useful! Too cute! You have such cute ideas and are so creative. Great photos! I love all your projects, especially the yellow pots! The Japanese maple, clematis, and jasmine are beautiful too. This is a very pleasant post. Lots to look at. I like you clematis. It is so full. And the projects are sweet. I have a few projects on the back burner. Oh my…more colorful cuteness! Loving all of your projects and you know how much I love that you paint everything such fun colors…you are my color guru! Enjoy your break…you soooo deserve it! The smell of jasmine is just the best! Love how you have it climbing. I noticed your shutters too..so cool! All of your projects are cute. The pots really came out nice and bright and eye catching! Debbie, Wow. Wow. Wow. Your Clematis and Japan Maple are stunning! Your front yard has tons of 'curb appeal'. Also, I think your blog is fabulous. I've just discovered from Susan's Outdoor Wednesday. We see you've been busy with spray paint again! Your porch looks great! So do you beautiful flowers! Debbie, I never think of using color! Unless you figure white is a color. The numbers thing is sooo cool! Oh I love all that color! Just beautiful! Isn't Spring so lovely! Especially at your house — thanks for your very sweet visit to my Spring tabletops. Debbie, you house decor is as bright and colorful as you are. I absolutely love the yellow pots with the black letters — so striking. Yes, I would love to sit there and stay a while. The combination of your items draws me in. You just do not stop, girl. You know — sometime you're going to sit down and realize that you're really tired (haha). You'll take a five hour nap or something. I admire your stamina and would like to know what vitamins you are taking. What a cute project! Your porches are just lovely-I love all the colors! The jasmine is unreal!! Have I told you yet your clematis and jasmine have me drooling! Well they do!!! So beautiful! Love the watering can w/the house number, too cute! Great idea! oh i am sooooo jealous …. your clematis is sitting in sun while mine collects raindrops … i love that cross … and the pots idea is just too cute! Beautiful garden and fun house numbers! Such long numbers – here in NH we have short numbers, Mine is 25, I just might put them on a pot out front! You absolutely amaze me. Those pots are so cute and that watering can is perfect. Your home is gorgeous. Hey Deb- Your landscaping looks beautiful!! Love the pots with the numbers and LOVE the cross on your porch,I can see why your friend wants it back(LOL)!! I am so in love with those yellow pots!!!! You are so clever! Your plants are beautiful. I have to give this flower thing a try. Yours are so pretty! Debbie, Fabulous, fabulous, fabulous! 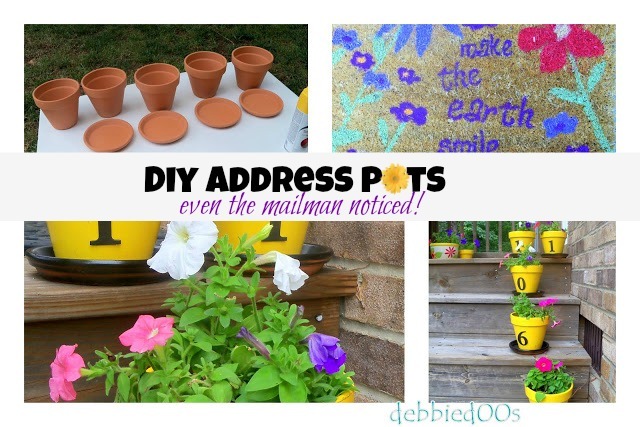 I love the address #s on the planters and all the beautiful work you've done in your yard. Gorgeous. I have two black rockers on my front porch also. 🙂 Thank you so much for linking this post to Woo Hoo! Wednesday for all of us to enjoy. Looking good debbie! Your yard is beauuutiful! Hi Debbie, Your porch looks so cute and inviting and that Japenese Maple is beautiful! Your cross looks so awesome and I love how you painted your pots in the bright, cherry yellow, no one will miss your house now! Have a wonderful day! I love the yellow pots what a great idea! The porch is so comfy I just want to sit and read a book!! Love, love the pots. You picked great colors!! I'm here from Woo Hoo Wednesday, and I have to say–your blog design is ADORABLE. It's just so friendly and FUN!!! Also, I really love the yellow number pots. Again–friendly and FUN! What can I say that hasnt been said? OK, now I know what to say.. 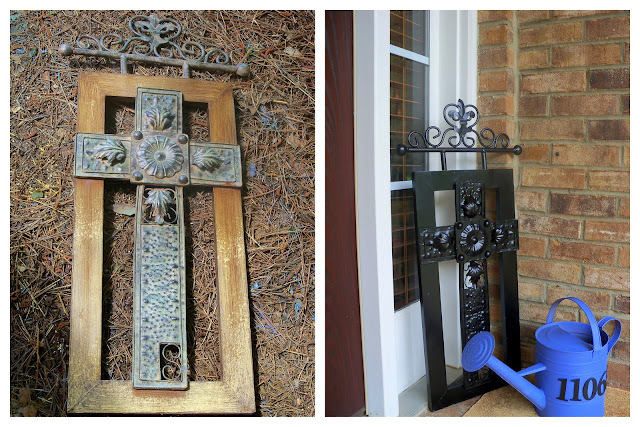 I love what you did with the cross , all of your projects look just wonderful ! Thank God for inventing spray paint! I used the last of the pink that I painted the candleabra with and painted my chest freezer pink! My husband thought I was crazy, but I was tired of the primer silver he had added to the rust spots! 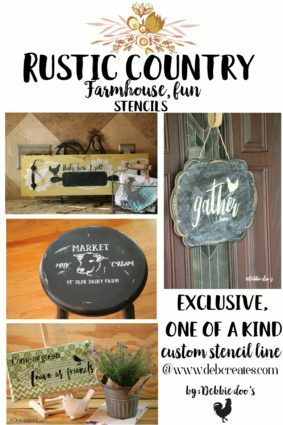 Great ideas for painting porch items!! Love the numbered pots! Maybe it is just me, but when I first glanced at your jasmine picture, it almost looks like the shape of a rooster!! Or am I losing it….!! I'll be gone all weekend so have a great Memorial Day holiday!! Great idea with the pots! I think you need to be the spokes person for that yellow paint! Why don't you contact the company and tell them all the things you have painted and maybe you can get your pretty face on one of those cans, or a commercial, lol! I love that yellow, thank you for finding it for all of us! More Awesome decorating, ideas and pictures, Debbie!! Good luck with your garage sale! Debbie, you never ceased to amaze me! I always found myself saying wow every time I visit! 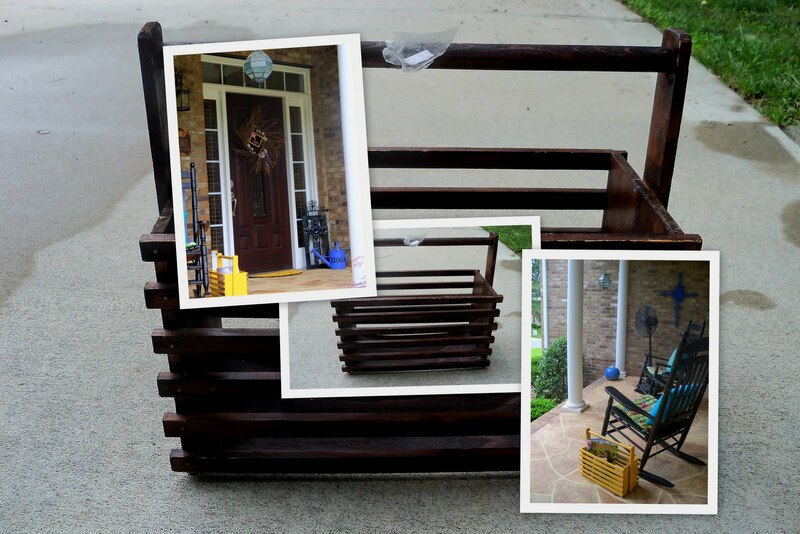 You're so creative..
Oh to have a front porch with a rocker… Love your little touches to make it so comfee! love how bright your porches are. those pots are fantastic in bright yellow. great job! Debbie it all looks fantastic!!!! So beautiful and colorful! I cant wait to get going on our new landscaping! Blisters and mud here I come! I like your new cross and agree with you about distressing it. Your magazine holder has given me an idea for the magazine rack I found a few months ago. I think I will paint mine turquoise and put it on my back patio where I like to read. Your porch is delightful! And I really love your flower pots! Love your porch! Such personality. Makes me miss my old front porch! You have everything looking so cute and welcoming. LOVE those yellow pots! I am new to your blog. Followed a comment at Kims. Saw your were from the Carolinas. I live in Asheville, NC…are you near? I love your yellow pots with the house numbers. I think I may have to try this! Love the little punch of yellow… it really does add so much to the porch. Thats great Idea Debb theu look fabolous in yellow..
As usual – Amazing!!! But those flower pots are sooooooooo cute!!! Hi Debbie, I hope you have a great weekend too! Thank you for visiting and leaving your sweet comment on my “Transformation Thursday”; Wicker Pram! I was so excited when I found this wicker pram with the red and white gingham hood and red wheels, I knew, of course, that I had to add red geraniums. Cute porch decor!! The painted pots add such cheerfulness! What a fabulous idea! I love the house numbers on the watering can and I plan on doing that. 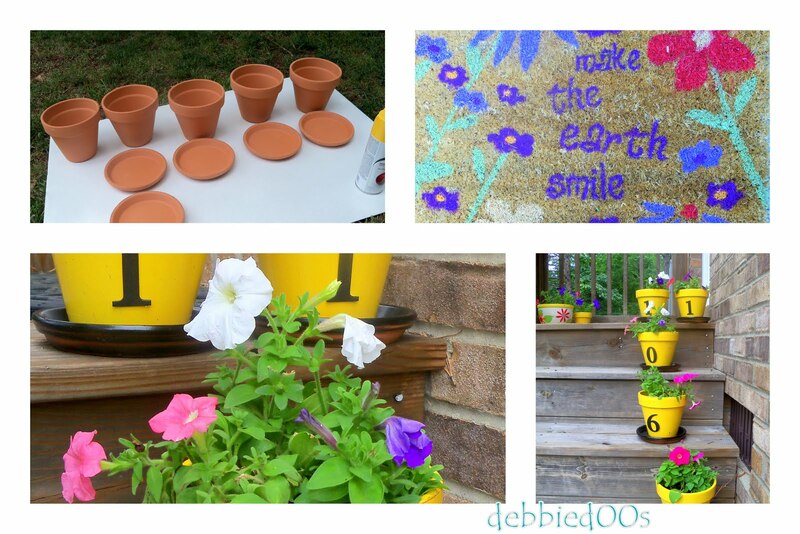 I got fun watering can for Mother's Day…woohoo love this idea! And your purchase looks wonderful!!!! Great projects Debbie! In fact, you inspired me to spray paint a pot! I just got done giving it the first coat of glossy red. Your yard and home are so beautiful. What a happy trek up to your doors!! Your home looks like fun!! I don't have to drive far to Crazy Town either! Wow! You are so creative! Your whole house must be packed with original pieces! That is so cool!! I was so happy to see your clematis…mine didn't make it this year…the buds were huge and ready to open any day, I was so excited then one morning…gone, all frozen to death. May I covet yours….however my jasmine did make and I can't wait to smell it…we are a little behind your good weather up here in the NW. OH wow! I am in heaven for the oh so darling pots and watering can! Great job a always! Thank you so much for stopping by! Love your landscaping. You did a great job on the flower pots, they look so cute. Good S post. Beautifully colorful S post. Good luck with your yard sale partay! everything looks wonderful! great job! Your house is so inviting! Thank you for linking up to Home and Family Friday. I hope to see you next week too! What a happy looking and colorful home! Looks great! We plant a Carolina jasmine at each house we move to. I have ours grow up a trellis. I never thought about it growing up a brick wall. What a pretty place! You are so creative… I envy that. Visiting you from New Friend Friday! I LOVE your yellow pots! Just so sunny & vibrant! :::swooon::: I would LOVE to spent a wamr afternoon hanging out on your beautiful porch! Debbie, Debbie! You leave me sitting here with my jaw dropped looking at all your cool projects! Thanks for this fun and interesting stop on my little journey through Alphabe-Thursday's Letter "S"! I'm hoping to drag Mr. Jenny to an antique mall going out of business later today…fingers crossed I'll have a treasure to link up to your meme! Thanks for participating in A-T and adding your own unique spin on decorating! Yay! I get to be comment #100!! That's pretty crazy!! I love what you've done! It really looks so fun and inviting! Thanks so much for joining the porch party on Poppies! It's been a true pleasure! Your porch is lovely – I could sit there for hours. But I must move on. I really like the cross – I agree, distress it a little. What a beautiful yard with some outstanding flowers and I really love the red maple!! I adore your yellow pots and everything that you painted that color. After seeing your chairs that you painted in that shade in an earlier post, I painted a few things yellow too. I am waiting until my impatiens and other annuals that I painted fill in a bit more before I post pics. Wow…what a cheery home! Good for you…I'm inspired!